Todea (after German mycologist H. J. Tode, 1733-1797) is a genus of two species with one being ornamentally useful in mild climates. Todea barbara (strange), a tall species related to Osmunda, is from Africa, New Zealand, and Australia. The rhizome is erect and forms a trunk, which in its native habitats can reach 3 ft. (90 cm). 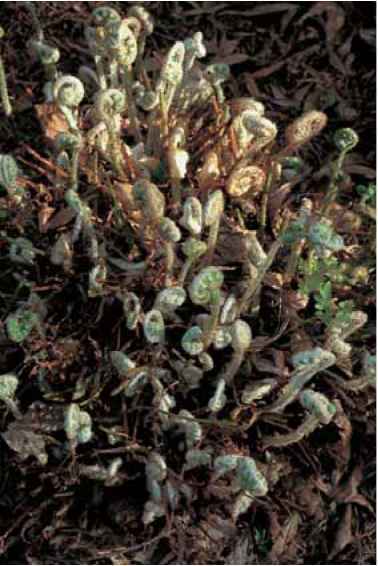 Deep green, substantial, bipinnate fronds are ovate and are often 4 ft. (1.2 m) tall, half of which is stipe. Sori are borne in a curious fashion next to the rachis on the innermost third of the basal pinnules. Spores are green and shortlived. This is a handsome species for cultivation in Zones 9 and 10 where it likes cool shade and damp soil. Devoted collectors have tried pushing and testing its cold resilience in customized Zone 8 locations, but even with protection the plant is almost always destroyed by the first severe winter (and if that does not do it in, a following cold winter will). Trismeria trifoliata with its nonfernlike foliage.